I-471 to East on Memorial Parkway, left onto Wilson to Right on Bonnie Leslie Ave. Home is located on the right between Berry and Lafayette. Well maintained Mid-Century Modern two family in the highly sought after Bonnie Leslie Area of Bellevue. Lower unit boosts 2 bed/2 bath, updated kitchen with granite counters, coved ceiling in the main living room, hardwood floors, a huge great room that opens on a covered deck and a two car garage and storage to boot. Upper unit has large living with coved ceilings, hardwood floors 2 bed/1 bath. Bellevue was named after the Revolutionary war hero General James Taylor, one of the wealthiest men in Kentucky after the Civil War. He named the city, Bellevue (Beautiful View) after a creek near his plantation in Virginia. Not only did he name the city, but he also promptly named most of the streets in the historic district – Lafayette Avenue, Taylor Avenue, Washington Avenue, etc... One can visit his home on the East Row Historic District in nearby Newport. 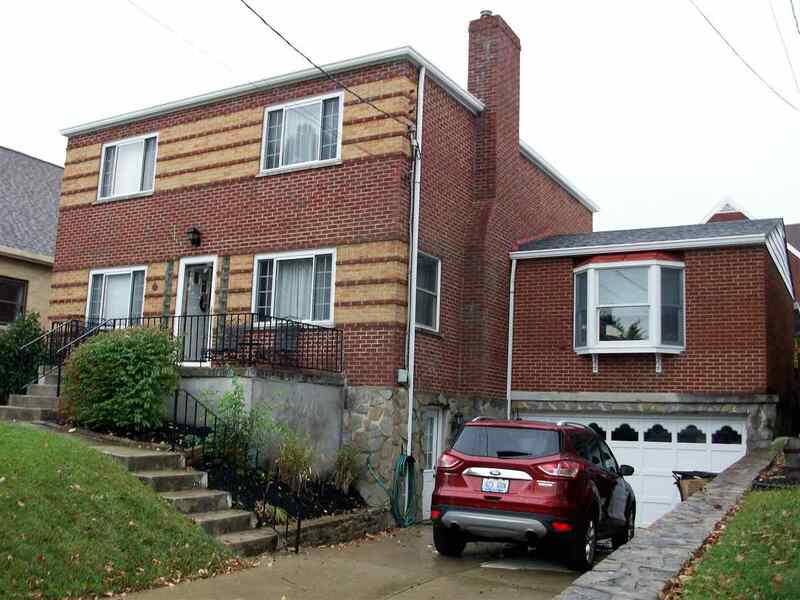 With its spectacular front porch view of downtown Cincinnati and Mt. Adams, Bellevue is tucked into the northern corner of Campbell County, bordered by Newport on the west, Dayton on the east and the Ohio River as its northern border. Bellevue is poised for a substantial economic development explosion as one of the Northern Kentucky riverfront’s last underdeveloped sites. Several residential and commercial developments are revitalizing this city of just over 6,400 residents. Bellevue’s focus on riverfront living and its easy access to downtown Cincinnati continues to draw homeowners from surrounding areas. Bellevue offers many styles and price points for homes. Its residential areas have well-preserved old homes that exude in charm. From midrise condominiums with breathtaking Ohio River views to more modest homes, Bellevue has it all. Less than five minutes from downtown Cincinnati off easily accessible I-471, it’s easy to get around in Bellevue. The Daniel Carter Beard Bridge (also known as the “Big Mac”) connects Bellevue with downtown Cincinnati. Meandering Kentucky Rt. 8 (Fairfield Avenue) bisects the city, linking it to the nearby entertainment district in Newport as well as the Mary Ingles Highway along the county’s riverfront. The Transit Authority of Northern Kentucky (TANK) provides bus service through the region, and into downtown Cincinnati. Two marinas offer water transport and Ohio River docking. Greater Cincinnati International Airport is a close 13 miles. Several Northern Kentucky hospitals and their branches, including St. Elizabeth Ft. Thomas, are within a few minutes driving. The Bellevue and Dayton Joint Fire provides EMS service to the area. With its emphasis on antiques and arts and crafts shops along Fairfield Avenue, Bellevue is a shopper’s haven. Nearby grocery and destination shops provide for the homeowners basic needs. Just across the river in downtown Cincinnati is home to some of the area’s premier shopping destinations; area shopping malls are within a 15-minute drive. The business association hosts many local events that appeal to those who want to support the local restaurants and shops. With its front porch view of the Ohio River and all of downtown Cincinnati’s numerous festivals and events, Bellevue residents are uniquely poised to participate in just about whatever they choose to do. From boating, to antiquing, shopping to exploring, it’s all minutes away. Sports lovers will enjoy Bellevue’s parks: the Thomas J. Weithorn Memorial Beach Park is home to a summer concert series for all residents to enjoy. The Bellevue Veterans Park offers three ball fields, a busy volleyball court and horseshoe pits. Swope Park has a playground and basketball courts. The Callahan Community Center offers additional recreation. The nearby Newport on the Levy provides ample nightlife opportunities and across the river you’ll find professional football, baseball, hockey and numerous sports venues. Community events include an Art in the Park, Halloween trick or treating and a Christmas Walk.